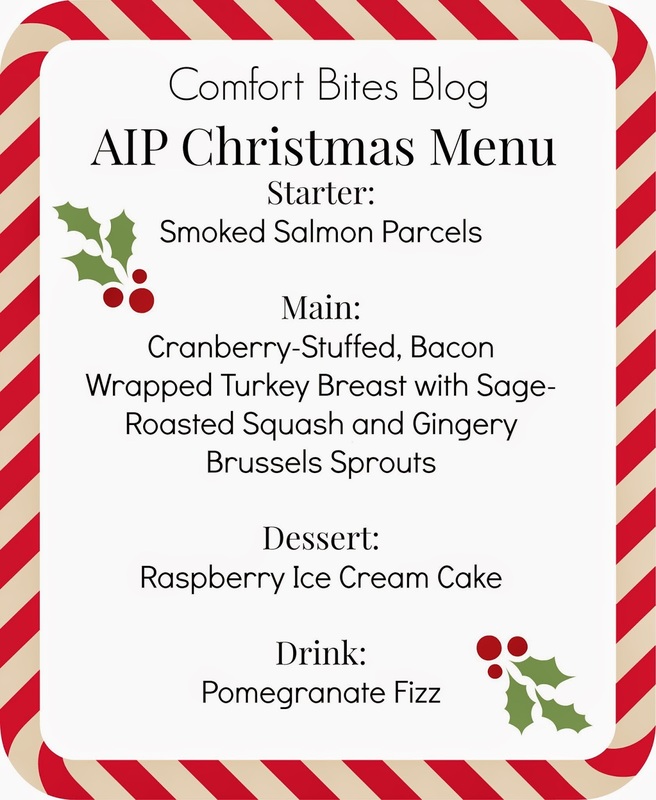 There's all the traditional goings on: smoked salmon, turkey, Brussels sprouts, cranberry sauce - and it's all totally AIP compliant. 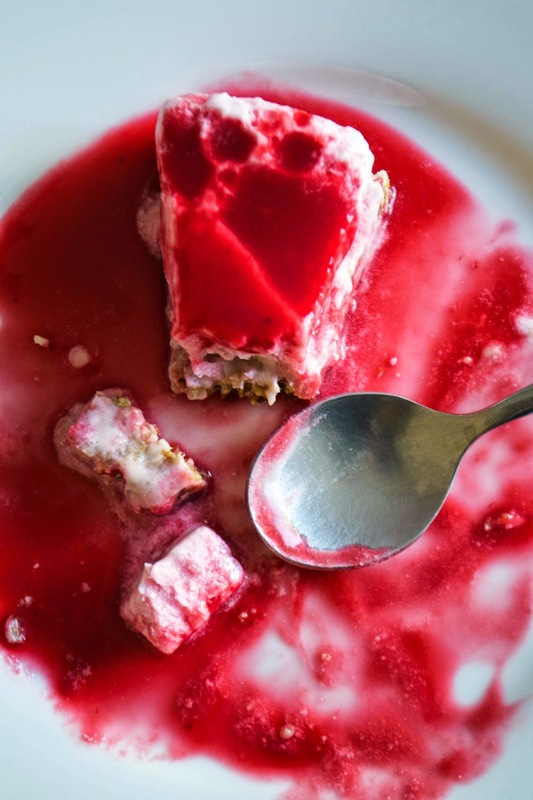 There's a raspberry ice cream cake as pudding, too - so you don't need to compromise on anything that you might regret the next day. And a drink that's fruity and fizzy but sharp at the same time - so you won't miss the wine with your dinner. I hope you like it, and wish you all a super Christmas. 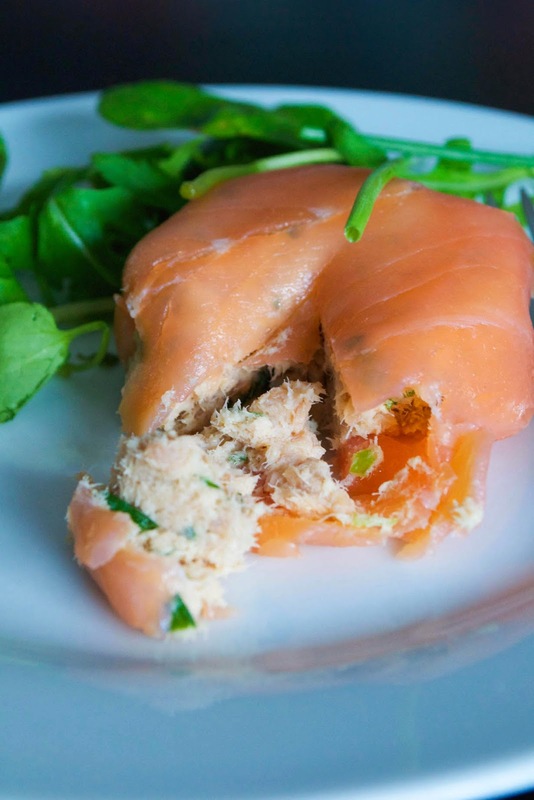 This was my version of a posh smoked salmon mousse parcel I used to often have at restaurants in the old days. Of course, they were full of cream cheese and black pepper, which are out on the autoimmune protocol. Cue the brilliant Rachael from the blog Meatified, who came up with a salmon spread that was AIP-compliant. I jiggled some of the ingredients about a bit to make it taste more mild, added in some traditional smoked salmon slices and hey presto - our posh Christmas starter was born. It can be made ahead, just make the parcels the day before and store them covered, on a plate. Take them out and allow to come just to room temperature before serving. Serve it with a small tangle of watercress, rocket (arugula) or spinach leaves dressed in a little olive oil and salt. To serve: 4 slices smoked salmon and salad leaves. To make the filling, blitz the spring onion, canned salmon, 2 slices of smoked salmon, lemon juice, coconut milk and chives until smooth. Next, take one of the remaining slices of smoked salmon and put it on a board. Dollop 1 heaped tablespoon in the centre of the slice, and fold the salmon slice around it, so you have a rough circle-shape. Tuck the ends of the salmon slice underneath the parcel and you're done. This is one of the recipes in my first ebook, Simple Autoimmune Paleo Comfort Food. When I made it I thought how wonderful it would be as a festive main course, with its flavours of cranberries, orange, turkey and bacon. And because it's the breast meat, it cooks in a fraction of the time that a whole turkey takes to cook - and will take up less room in the fridge, too. Go check out my Sage Roasted Squash side dish that would be lovely to go alongside. The Gingery Brussels Sprouts recipe is up next. First, make the cranberry sauce. Add the cranberries, maple syrup, salt and orange juice to a small pan and simmer for 5-7 minutes, until the cranberries are softened and the sauce has thickened slightly. Allow to cool, cover and refrigerate. It’ll last in the fridge for about 5 days. Once the cranberries have cooled, get on with the turkey. Place the turkey breast on a chopping board in front of you. Using a sharp knife, cut a slit in the side of the breast, as if you were making a chicken kiev. Make a little pocket in the breast, running almost to its length, but don’t cut all the way through. Next, take a couple of spoonfuls of the cooled cranberries you made earlier and arrange them in the centre of the pocket. Careful you don't touch the spoon with the turkey and then put it back in the cranberry sauce. Pinch the breast back together and wrap with the bacon, trying to get the ends of the bacon underneath the breast, as you go. Once you’ve covered the turkey breast in bacon, secure the top of the joint with cocktail sticks, or tie with string if that suits you better. Carefully lift onto a baking tray (I line it with foil to make washing up easier) and roast in an oven heated to gas mark 5/190ºC/375ºF for 40 minutes, or until thoroughly cooked, all the way to the centre of the joint. 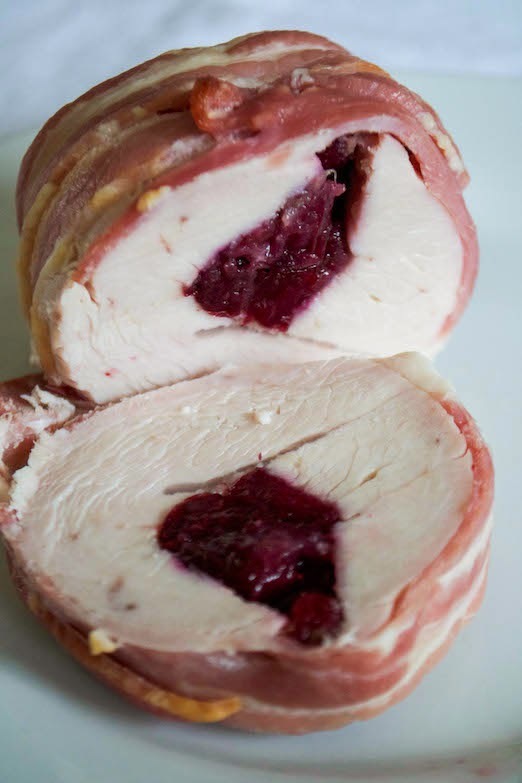 Once out of the oven, allow the bacon-wrapped turkey breast to rest for 5 minutes and then slice, taking out the cocktail sticks as you serve. Christmas just wouldn't be the same without Brussels Sprouts, and although they take a lot of flack for being generally hated, I think they're great, if cooked the right way. 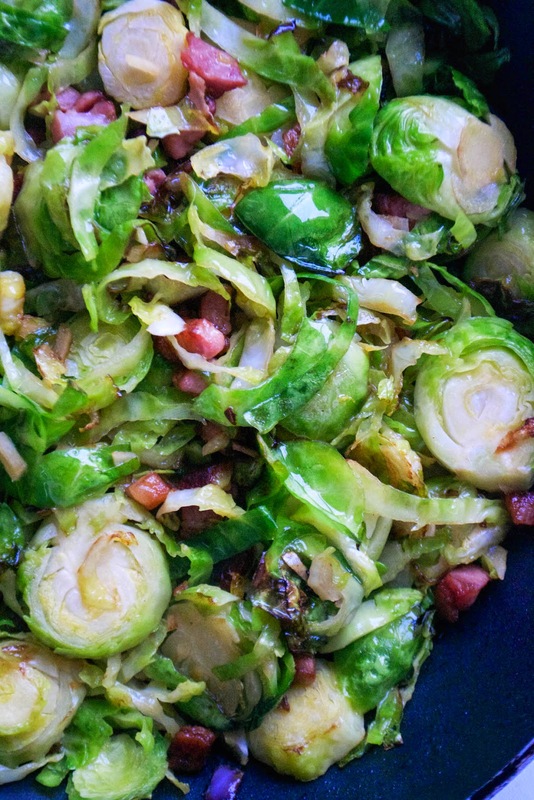 My children love eating Brussels Sprouts all year round, something that many people are surprised by. My secret? I fry them. With bacon. Lots of bacon. Shredding them means they're quicker to cook and turn a bit crispy, giving them a sweeter flavour. I've added ginger for a Christmassy touch - it works well with the smoky bacon and it's good for you, too. Dry fry the bacon or pancetta in a frying pan, until the bacon starts to turn golden and the fat is released into the pan. While that's happening, clean and slice the sprouts and add them to the pan, along with the ginger and the garlic. Stir-fry for five minutes or so, until the sprouts are cooked and aromatic. Taste, and season with a pinch of salt, if needed. I made this in the summer, but felt it was better as a special celebration-style pudding. It doesn't take much work to make, and it's really tasty. I serve it with the sauce from Eileen at Phoenix Helix's Raspberry Panna Cotta, drizzled over the top. Don't skip the sauce - it really makes the whole thing special. I've included the quantities I made for a small cake, if you want a thicker ice cream layer, increase the quantity - if you want to make a bigger cake, obviously double up the base too. The only thing about this cake is that the ice cream topping sometimes does slide off the coconut and date base as you cut it, but this gets better if you leave it at room temperature a bit longer to soften up. And anyway. With how this tastes, you probably won't care. 1 tsp vanilla extract - if you are still on the elimination phase of the AIP or are sensitive to even tiny traces of alcohol, use vanilla powder instead. 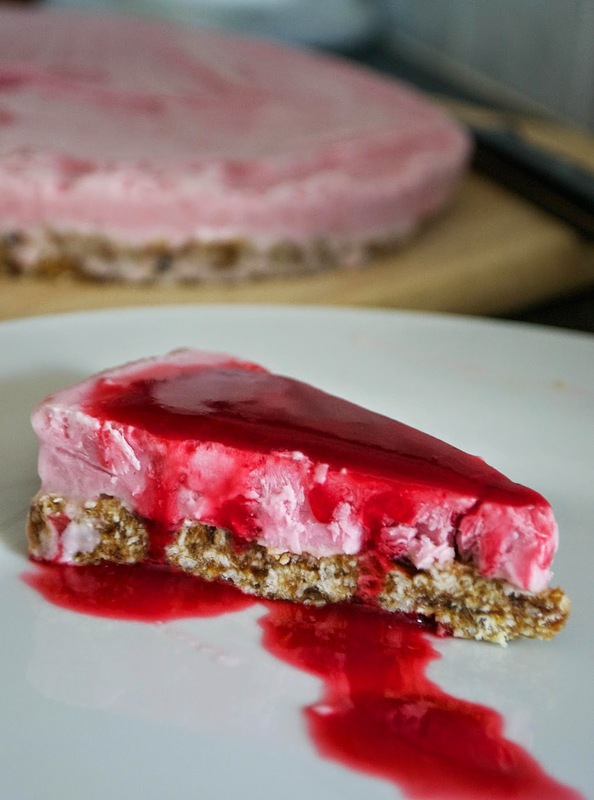 For the sauce: visit Phoenix Helix's post and make the sauce from her Raspberry Panna Cotta. Check there are no stones in the dates (the last thing you want to do is ruin your processor blade) and dump them into the bowl of a food processor. Add the coconut, the coconut oil and the vanilla seeds, if using, and pulse until the mixture turns sticky. You’ll know when it’s ready as the mixture will start to clump as it whizzes around in the processor. Line the base of a small, 20cm or thereabouts springform cake tin with cling film so the cling film comes up and hangs over the sides and press the mixture into it. Slide into the freezer while you get on with the ice cream topping. Mix the coconut milk and the fresh raspberries in a bowl with the honey and blitz with a stick blender. If you want your topping to be seedless, pass the mixture through a fine sieve, leaving behind the tiny raspberry seeds as you go. Churn the mixture in an ice cream maker until it reaches a soft-serve consistency. Take out the cake tin from the freezer and pour the raspberry ice cream into it and slide quickly back into the freezer, draping the cling film that's hanging over the sides of the tin over the top to stop it drying out. Freeze until set - about 3 hours (depending on your freezer). When you're ready to serve, cut the cake into slices (it might be hard if very frozen, leave out for a little bit so it starts to soften) and drizzle over the raspberry sauce as you serve. Very simple, but also tasty and you won't miss drinking the wine with your Christmas dinner. 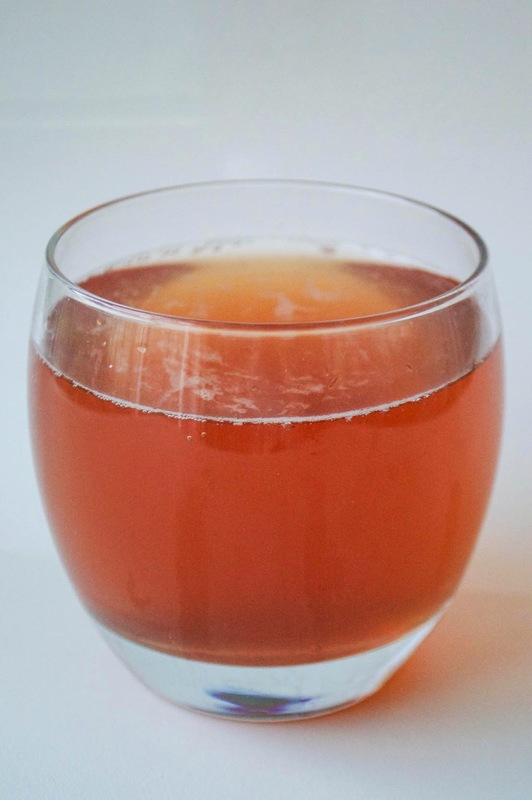 It's fruity, pink, fizzy and has a tartness to it, thanks to the pomegranate molasses, that'll go perfectly with your food. To make it: Fill a small glass with chilled, plain sparkling water. Stir in a teaspoon of pomegranate molasses. 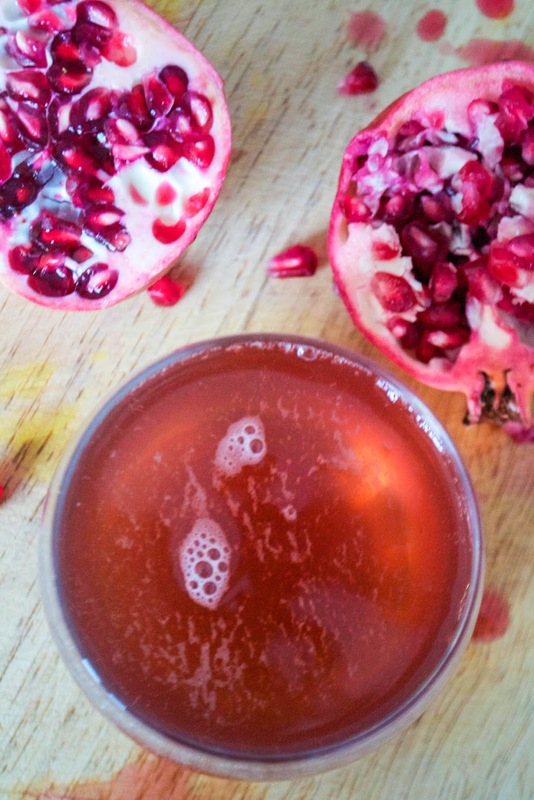 Next, cut a pomegranate in half and squeeze all the juice out of one of the halves by hand, into your glass. Taste, adding more juice if you think it needs it. 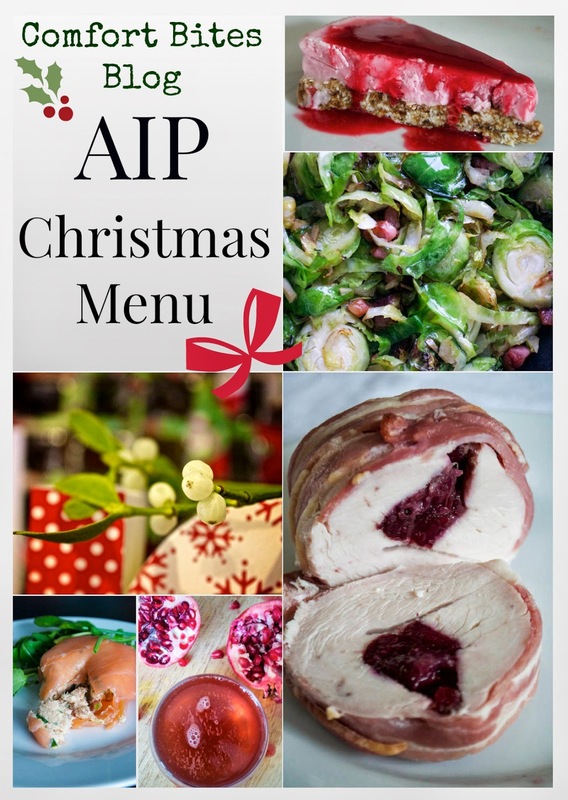 Have you seen these AIP resources that might be useful over the Christmas and Holiday season? Like these recipes? Find over 90 more AIP compliant, paleo recipes in my ebook SPICE. Play with herbs and spices and add flavour to your food! Check it out here.